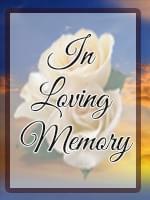 Vaughn M. Thompson, 70, of Mesa, AZ; passed away on July 23, 2009 in Mesa. She was born April 16, 1939 in Thunder Bay, Ontario, Canada. She was a homemaker and her hobbies were stain glass, card making, reading and golfing. Vaughn is preceded in death by her mother: Betsy Obrien; father: Don Gapen; aunt: Grace; & uncle: Harold Lundquist. Those who remain to miss her are her husband: Richard Thompson; daughters: Carrie, Laurie, Brandy and their families; 7 grandchildren; & 3 great grandchildren. A Memorial Service will be held at 10:00 AM Monday, August 3, 2009 at A Wise Choice Desert View Chapel, 9702 E. Apache Trail in Mesa. Inurnment will be at St. Mary?s Cemetery, White Bear Lake, MN.